An engineer aboard the cable ship René Descartes describes its control systems for an ROV and trench-digging plow in Kitakyushu, Japan, July 9, 2015. The ship is laying down the 9,000-km FASTER Internet cable system between the US and Japan. The US$300 million FASTER cable system, backed by Google and East Asian telecom firms, will have a peak capacity of 60Tbps (terabits per second) when it's ready next year. About 6000km of the cable has been loaded onto the cable ship, René Descartes, which is docked at a submarine cable factory in Kitakyushu, southern Japan, operated by NEC group firm OCC. It will be the first time for the vessel, owned by French telecom firm Orange, and her crew to lay some 9000km of cable in one go. One morning last week the slim cable, about 2cm in diameter, was being loaded from the factory to the ship at its dock. Since the cable is mostly white and featureless, it takes a keen eye to see that it's actually moving into the vessel, and rather quickly, on a long bed of rollers. "The most important challenge is the length of the cable," said Claude Le Maguer, an Orange Marine engineer in charge of the operation. "It's the first time that we will lay such a long distance at the same time." Now and again, a crane lifts a repeater unit aboard the René Descartes. Like copper-hued beads strung on a long white necklace, these missile-shaped devices, weighing 200 kilograms or more and placed every 40-100 km, amplify the signals traveling through the thin optical fibers in the cable. They're gingerly placed on racks above the tanks, the cable forming short separate loops to and from the tanks. To ensure the FASTER cable is placed in the correct spot, the René Descartes uses a differential GPS (DGPS) system, which offers greater accuracy than standard GPS, as well as a dynamic positioning (DP) system to make sure it's within a few meters of the plotted route. It has twin bridges, one looking forward and the other looking back at the cable-laying work, to make sure it's on course. 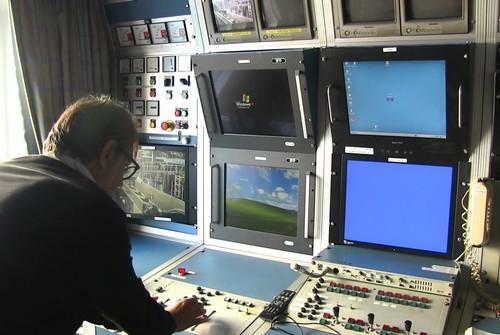 A computer system on the bridge that's still running Windows XP helps engineers operate the massive plow and robot submersible that are required to lay the cable in shallower waters. Along a continental shelf, the cable must be buried to protect it from ships' anchors, fishing nets and other hazards. That's where the Elodie plow comes in. Painted power-shovel yellow, this steel monster is 10 meters long, 5 meters high and weighs 32 tons in the air. Hoisted into the sea by crane and then towed by the ship, the Elodie's 3-meter plowshare digs a deep trench up to 2 km below the surface while it sends video, sonar, hydrophone and other data back to the bridge. The other oversized tool used by the engineers is the remote-operated vehicle (ROV) Hector 6, which tips the scales at 9 tons. Running on caterpillar tracks, the ROV can work in conjunction with the plow and has jets that push sediment over the cable, burying it. Hector also has two robot arms, controlled via small-scale replicas on the bridge, that can manipulate the cable as well as objects such as rocks that are in the cable's path. It also has a variety of sensors as well as HD video cameras to give engineers a view of how the cable sits on the bottom. The cable can be repositioned if it's incorrectly placed or retrieved and repaired if it gets damaged, Le Maguer said. With six fiber pairs and 100 wavelengths, FASTER's 60Tbps design capacity is about ten million times faster than your cable modem, according to Google. While it will be the largest capacity cable ever installed for the Pacific, Internet users on either side of the ocean are unlikely to notice a dramatic change when FASTER is put to work next year because they don't have the option of choosing how their data is routed, according to one NEC official. Due to the additional capacity, the overall Internet experience will simply be -- as you might expect -- a little faster.